Race Management for weekly races is undertaken by crews of participating boats who undertake Race Officer Duty on a rota basis. A race officer who cannot be present on the prescribed day must find a substitute to run the race. Our Sailing Instructions for the specific event provides information to assist the race officer in running the race. For Sunday racing and regattas the race management team is usually aboard our vessel MV Admiral Jack and will not compete. We ask that at least three crew are available, a Race Officer and two helpers, who will display or remove flags, maintain accurate timing and record boat and time details. 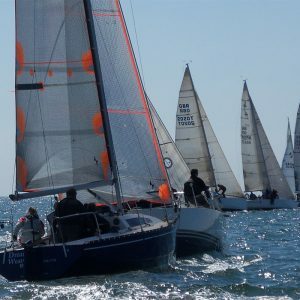 For Wednesday evening racing the race management team are allowed to compete aboard their own boat; it is usual to start the race via a gate start; competing boats are asked to record their own finish time.